Acne scars may remain on the skin even after teen acne and can be a real sensitive spot for even very young people. We can easily handle them as long as they are fresh and have not become china-white. Young persons are particularly sensitive about their appearance, and acne scars usually affect facial areas. Therefore, it is not only recommended to tackle the problem due to aesthetic reasons, but also because of psychological comfort of patients. 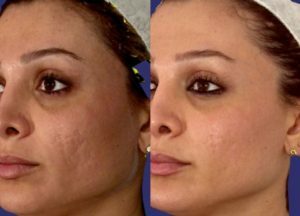 The revolutionary, world-wide known Harmony laser is equipped with intelligent technologies, which contain selective filters that aim with light beams straight at selected cells, causing microdamage, which are treated spontaneously, enhancing, as a result, a new skin structure, which visibly improves the condition of the patient’s skin. Harmony laser does not allow for pain. It has cooling coverings placed in the head; a patient may feel heat and slight burning during a laser therapy, but after application of an anaesthetic product, the procedure is basically pain-free and lasts less the twenty minutes. Around the world people undergo the fantastic treatment with Harmony XL iPixel ER:YAG laser, getting rid of their skin problems for long years. Thanks to the microdamage and activation of intercellular regeneration process, their skin becomes much smoother, more radiant, elastic and free of unsightly scars or spots. The procedures are performed in cycles. Depending on the condition of the skin and accumulated scars, a laser therapy is conducted in 1-6 series at a few-week intervals. The total therapy time can last a few months. Who does a laser therapy with Harmony XL iPixel ER:YAG help? Treatment of acne scars can be facilitated by complementary procedures, which will additionally contribute to bleaching and regeneration of the epidermis, as well as internal layers of the skin. A detailed treatment plan will be suggested by a physician in our laser therapy centre in Warsaw. There is a short convalescence period after the treatment, which lasts up to a few weeks. In this time it is recommended to use creams with a high SPF, avoid skin irritating products, hot baths, sunbeds, spicy food, cigarettes and alcohol. Swelling and redness are neutralized with the use of cooling compresses. During the period of the skin peeling off, we moisturize the skin well. Wonderful effects of smooth and bleached skin will become visible after 4-6 weeks after a series of laser therapy. Effective scar and acne spots removal. Treatments with Harmony XL iPixel ER:YAG laser for long years allow to forget about the problem of unsightly skin lesion.